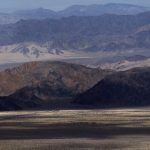 Approved by Congress in February and signed by President Trump on March 12, 2019, this omnibus public lands bill includes Senator Dianne Feinstein’s California Desert Protection and Recreation Act. CalWild first started working on Senator Feinstein’s Desert bill more than 10 years ago. The omnibus package also includes Rep. Paul Cook’s California Off-Road Recreation and Conservation Act and Rep. Steve Knight’s Saint Francis Dam Disaster National Memorial Act. 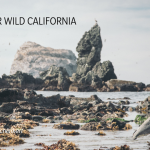 Here in California, the omnibus legislation protects more than a half million acres of public land as wilderness, National Park additions, scenic and special management areas, a National Memorial Monument, and wild and scenic rivers. Most of the protected areas and rivers are located in the California Desert. 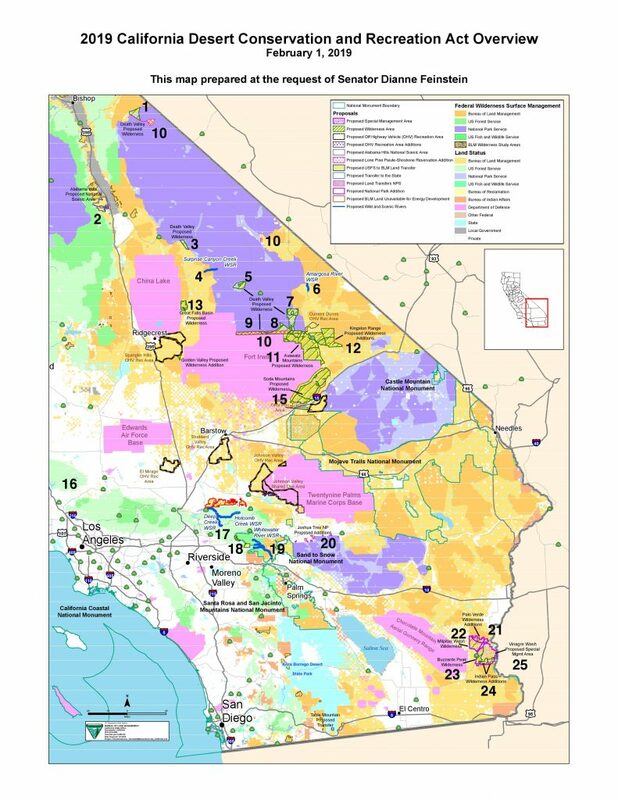 Below are the areas and rivers protected in California in the John D. Dingell Jr. Conservation, Management, and Recreation Act of 2019. Numbers correlate with the map in a north to south direction. North Eureka Valley-Death Valley National Park (DVNP) Wilderness – This 11,496 acre wilderness addition is located at the north end of the park and provides important connectivity between the park wildlands and BLM’s Piper Mountain Wilderness. Alabama Hills National Scenic Area – Located west of Lone Pine, the 18,610 acre Scenic Area has been the film location for many western movies. This highly scenic area of granite rock formations framed between the Sierra Nevada to the west and the Inyo Mountains to the east has become a vastly popular tourism destination in the Owens Valley and eastern Sierra. Panamint Valley-DVNP Wilderness Addition – This 4,807 acre wilderness addition includes portions of the Panamint Range and Valley south of Highway 190. Surprise Canyon Wild & Scenic River – Surprise Canyon is a rare year-round flowing stream in the Panamint Range. The designated stream begins near the old mining ghost town of Panamint City in Death Valley National Park and flows west to the edge of the Panamint Valley. Riparian habitat along the stream supports more than 70 bird species and the rocky areas above the stream are home to the threatened Panamint alligator lizard. Warm Springs-DVNP Wilderness Addition – This 10,485 acre wilderness addition protects part of an unprotected “donut hole” in the south-central portion of the park. Amargosa Wild & Scenic River Addition – This 3.4 mile addition near the community of Shoshone increases the protected length of the Amargosa Wild & Scenic River to nearly 30 miles. The Amargosa is a rare linear oasis in the desert south of Death Valley National Park. Its riparian habitat and wetlands support more than 250 bird species, the rare Amargosa pupfish, and the endangered Amargosa vole. The former route of the historic Tonopah and Tidewater Railroad provides an ideal hiking route along the river. Ibex Hills-DVNP Wilderness – This 23,650 acre addition includes the southern Ibex Hills and provides important connectivity for the migration of wildlife between BLM-managed wilderness between the existing Death Valley Wilderness to the west and the newly designated Bowling Alley addition to the south. The area provides important habitat for desert tortoise and amazing vistas of the park. Axe Head-DVNP Wilderness — This 8,638 acre addition provides important connectivity for the migration of wildlife between BLM-managed wilderness to the north and east with the existing Death Valley Wilderness to the west and south. The area offers amazing vistas of the park. Bowling Alley-DVNP Wilderness – This 28,923 addition to the Death Valley National Park Wilderness protects a long strip of public land between Fort Irwin and Death Valley. The area features rugged mountains, deep canyons, bajadas, open valleys, and pristine dry lakes. Quail Spring supports a rich riparian area attractive to many bird species. Death Valley National Park Additions – These 36,292 acres of additions to the park involve transfers of public land managed by the BLM to the National Park Service. The additions include the “Bowling Alley” between the current park boundary and Fort Irwin, which is also designated as wilderness. Avawatz Wilderness – This 89,500-acre wilderness displays rugged and colorful geology and geography, creating a commanding backdrop to the Silurian Valley. Nine natural springs provide water for bighorn sheep and other desert wildlife. The area is rich in Native American cultural values and is still used for spiritual and cultural purposes. 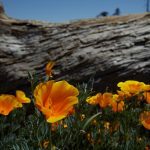 Kingston Wilderness Additions – Expanding the existing wilderness by 20%, these 52,410 acres of additions include some of the oldest rocks in California in the rugged mountains that loom over the Silurian, Mesquite, and Shadow Valleys. The area supports one of the highest concentrations of unusual plant assemblages and endangered wildlife in the desert, including bighorn sheep, Panamint chipmunk, and banded Gila monster. Great Falls Basin Wilderness – Located north of Trona, this 7,810 acre area has natural bathtubs fed by year-round springs and small streams. Hikers are treated to sweeping views of ancient Searles dry lake. The area also provides habitat for the Inyo brown towhee, a state-listed rare bird species. Golden Valley Wilderness Addition – This 1,250-acre addition complements the rugged mesas and lava rock of the existing wilderness, which is also known for its outstanding wildflower displays and historical values associated with the 20 Mule Team Borax Trail from Death Valley. Lower elevations provide critical habitat for the endangered desert tortoise and Mohave ground squirrel. Soda Mountains Wilderness – This 80,090 acre area includes the terminus of the Mojave River at Cronese Lakes, which provide important wetlands for waterfowl and shorebirds, including the endangered Yuma clapper rail. Threatened desert tortoise are found in the southern portion of the wilderness. There is extensive evidence of use by ancient Native Americans. Francis Dam National Memorial Monument – This 440 acre area on the northern Angeles National Forest memorializes the disastrous collapse of the newly constructed St. Francis Dam in 1928. The ensuing flood killed hundreds of people downstream. Today, the dam site supports one of the few populations of endangered California red-legged frog on the Angeles Forest. Deep Creek Wild & Scenic River – This 34.5 mile wild and scenic river includes Deep Creek and its tributary Holcomb Creek. From its source near Running Springs in the San Bernardino Mountains, Deep Creek flows north and then west to the Mojave Desert through a great diversity of habitat and elevation changes. Biologists consider Deep Creek an area of high ecological significance supporting numerous sensitive wildlife species, including the San Bernardino flying squirrel and endangered arroyo toad. 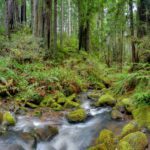 Deep Creek is also a state designated Wild Trout Stream and segments of both creeks are the route for the Pacific Crest Trail. San Gorgonio Wilderness Additions – The San Gorgonio Wilderness is expanded by 7,141 acres. The additions encompasses San Bernardino National Forest lands along the west and southwest boundary of the wilderness, including streams that drain into Mill Creek and the San Gorgonio River. Whitewater Wild & Scenic River – From its source on Ten Thousand Foot Ridge in the San Bernardino Mountains, the Whitewater River flows southeast 28.1 miles through one of the most remote and undeveloped watersheds in southern California to the Coachella Valley. 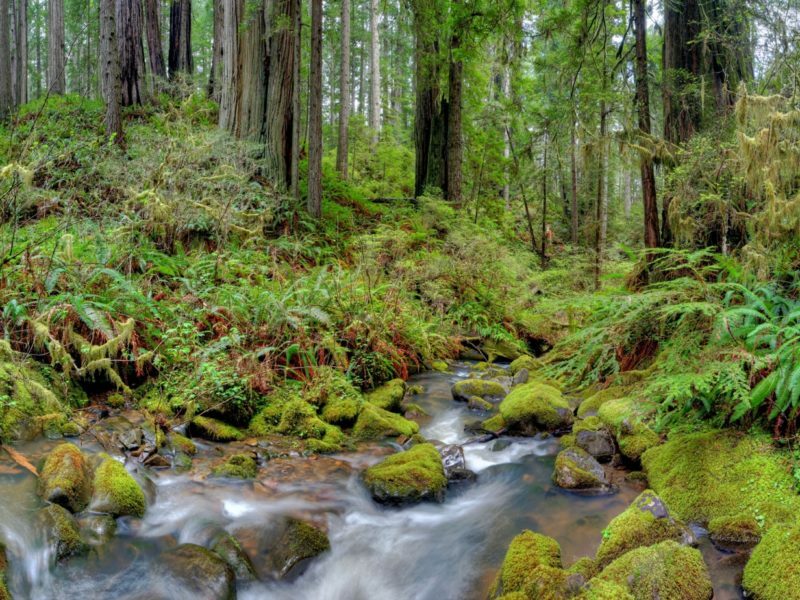 An area of high ecological significance, the river provides habitat for the California spotted owl, yellow-billed cuckoo, and bighorn sheep. The Pacific Crest Trail follows a lower segment of the river, which is easily accessible via the Wildland Conservancy’s Whitewater Preserve. The Desert Mountains Land Trust’s Bill Havert Whitewater Canyon Reserve supports a rare cottonwood forest in the desert along the lower river. Joshua Tree National Park Additions – This 4,518 acres of additions encompass scattered parcel of BLM lands adjacent to the north park boundary near the growing desert communities of Twentynine Palms and Yucca Valley. Palo Verde Wilderness Additions – The existing wilderness is expanded by 9,350 acres. The wilderness additions protect the lower elevations of the Palo Verde Range. Part of the larger Vinagre Wash Special Management Area, the wilderness provides important habitat for desert tortoise and bighorn sheep and includes the rarely-in-California Saguaro cacti on its southeastern margin. Milpitas Wash Wilderness – The 17,250 acre wilderness includes desert foothills, washes, and floodplains. It provides critical habitat for the desert tortoise, Gila woodpecker, and a host of other wildlife. Part of the larger Vinagre Wash Special Management Area, the Milpitas Wash region supports the largest Sonoran desert woodland in North America, including mesquite, acacia, palo verde, and ironwood trees. Buzzards Peak Wilderness – This 11,840 acre wilderness is part of the larger Vinagre Wash Special Management Area. Extensive private lands have been acquired and added to the public domains, making the area’s protection as wilderness feasible. The area is an important part of the traditional homeland of the Quechan tribe and possesses evidence of the tribe’s long history in the region. Indian Pass Wilderness Additions – Located west of the lower Colorado River, these additions total 10,860 acres and are part of the larger Vinagre Wash Special Management Area. 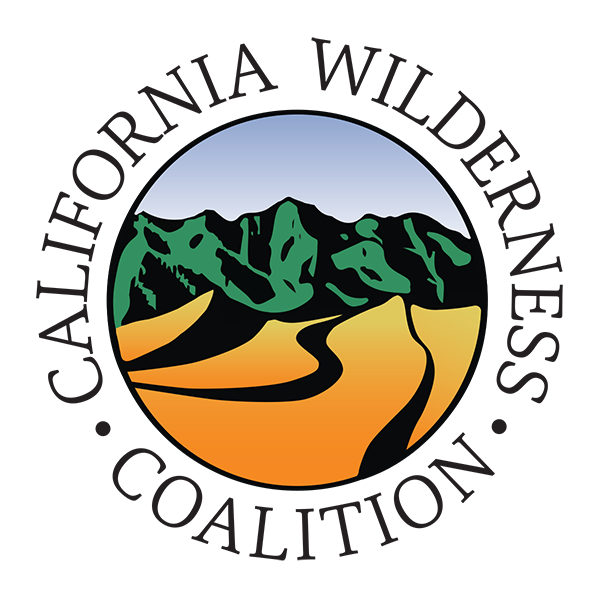 Encompassing the ancient homeland of the Quechan tribe, the wilderness provides important habitat for desert tortoise, Yuma king snake, Great Plains toad, and other wildlife. Vinagre Wash Special Management Area – This 81,880 acre area is located west of the lower Colorado River. The area possesses nationally significant ecological, geological, scenic, recreational, Native American cultural, and historical values. The Special Management Area also includes the Palo Verde Mountains, Milpitas Wash, Indian Pass, and Buzzards Peak Wilderness areas.